Making a canvas print from digital images is the prefect way to turn that favorite photograph into a piece of stunning photo art suitable for display on any wall. There is no easier way to turn your favorite photos into art ready to display than with digital prints on canvas from The Print Bug. All digital prints on canvas are created using the highest quality canvas. Stretching is available or just order it rolled and drop off at your local framing center. Our digital prints on canvas are suitable for hanging with or without a frame. 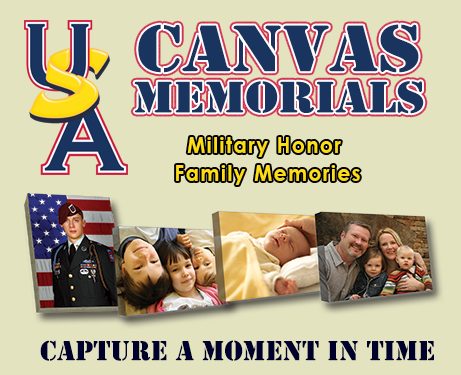 You will be amazed at how great that favorite photograph will look as a professional digital print on canvas. This is an honor Memo rial we did for Army Ranger Ronnie Johnson. We took his Wedding photo in his dress uniform and added the helicopter and folded flag as an Memorial. It is on display at the Texas Ranger Hall of Fame. 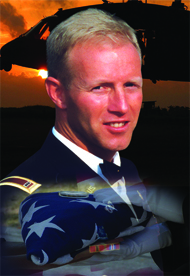 Ronald Johnson, retired from the military, he was on private duty in Iraq when his helicopter crashed in Baghdad. Johnson had a long distinguished career in the military’s Special Forces, including service in the 1983 invasion of Grenada. After retiring from the military, he began working for a private security company as a helicopter pilot. His career in the military earned him a variety of awards including the Legion of Merit, the Purple Heart, a Meritorious Service Medal, Air Medal, Joint Services Commendation Medal, Army Commendation Medal, Good Conduct Medal and Nation Defense Service Medal.